Hi everyone, hope you've all had a great week. The weekend is just about to start! Anyway, I just wanted to share with you a guys a guest post provided to me by a company called 'Luxury Bazaar' which specialises in high end accessories such as jewellery as well as fine arts and antiques. Guest posts are welcome here and it's a great way for my readers to discover other bloggers and companies as well as giving them a chance to have a voice on my blog. And isn't it slightly refreshing to hear about another person's perspective? If anyone is interested in being a guest blogger on QuestJen, you are more than welcome to let me know and we could figure something out! Please note that not everyone is guaranteed to be a guest blogger on here, there are some set guidelines etc. Everyone knows that diamonds are a girl’s best friend, but what about other forms of jewelry? As these 5 jaw-dropping antique pieces demonstrate, fashionistas have a whole lot more friends to make in the jewelry world than just diamonds! The majesty, pomp and glory of the bygone Victorian age is fully on display with these exquisite yellow gold/turqouise bird earrings. They are so delicate and pretty, while also sporting a certain confidently playful aesthetic that you rarely see any more. You can tell they were made a long time ago because of all the detailed work on the birds, which stands in stark contrast to the smooth and sharp lines of modern pieces. This is the sort of earring set that would make a splash at any event, whether it be a night on the dance floor or an evening dinner with fine wine. This ring has lots of bling! The stone is so huge that it’s hard to believe it's genuine citrine. Besides the huge raised stone, there are also 12 diamonds perched around the ring. It is rated at a 7.5 American ring size. While the details of its prior owner remain a mystery, one thing is for sure: they were super rich! One could easily see this ring fitting in perfectly at a dressy cocktail party in the 1950s or early '60s (think Mad Men). Check out this fun antique ring from a prominent estate sale. Talk about stunning jewelry! It’s made from platinum and sparkles with small diamonds ornamenting the centerpiece stone, which is a beautiful Burmese ruby. The pink stone is a perfect color for any stylish lady, and would fit particularly well with a sizzling red dress or black dinner gown. This oversized ring really makes a statement and really puts most modern mall designs to shame. More than any of the 3 aforementioned pieces, this incredible antique ring has a spellbinding story behind it. Designed during Western Europe's neoclassical period circa 1790-1810, this ring has real hair woven in a pattern under its glass covering. Talk about a conversation piece! 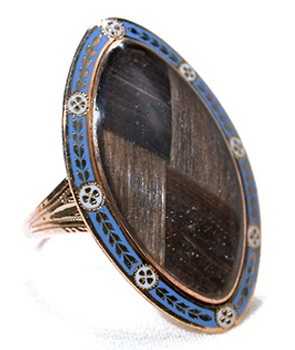 The 15k rose gold, French blue enamel, and oversized design of this piece will never fail to draw intrigued glances from fellow party-goers, but it's the presence of real hair from the 18th-19th century that makes this ring so incomparably unique. This fabulous garnet piece came from England and was made some time between 1790 and 1810, which is when these types of pendants were most popular among refined ladies. It’s crazy to think of all that has happened in the world since this piece of jewelry was made! The design takes clear inspiration from British religious iconography, but it also offers a certain natural beauty insofar as its design and layout are undeniably easy on the eyes. The shades of red in the garnet never fail to attract attention as they shimmer all around the larger flower in the center. Antique jewelry (also called "estate jewelry" because it is often passed down from generation to generation) exists in a whole different category of luxury goods. Each piece has its own vivid history and intriguing story to tell, directly connecting the wearer to the lives, amibitions, and trials of its previous owners. Some of it is stunning with beautiful gems and designs, while some of it holds sweet or sorrowful memories. What is most important, of course, is the future it will experience with you wearing it! 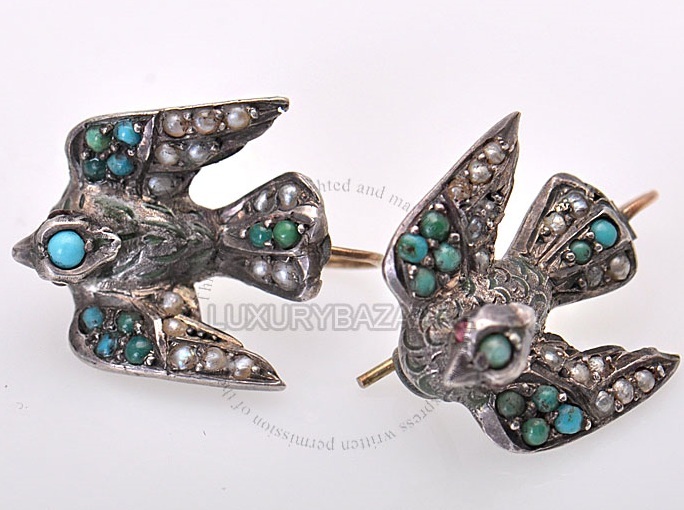 Thanks for that Roman, I absolutely adore those Victorian bird earrings, the turquoise stones are gorgeous! I love accessorising with jewellery pieces and I can never go wrong with a cocktail ring Huge stones and bling is my thing haha. The Victorian Bird earrings are just gorgeous! They're the perfect size and they're so adorable. And I checked the Burmese Ruby ring, and it is fabulous. The Victorian earrings are pretty awesome ! The cocotail ring is beautiful. I voted for u for the nuffy awards! really nice wedding rings and mens wedding bands. Really i like this very much.